The Simms G3 Guide Boots cost around $200 and are considered a piece of high-end gear. A glance at the list of features looks promising and I was definitely looking forward to review them. However, as always, I will give you my unbiased opinion and let you know if it is worth to spend that much money on wading boots. To be honest, although I always preach, If there is one piece of equipment you should spend more money on, it should be wading boots, the Simms G3 Guide Boots are the priciest I owned so far. I got them from a friends outdoor shop with a discount, so I did not pay the full price, still, they were a fair bit more expensive than my last pair. Needlessly to say, I had high expectations right from the start. In this review I will test the rubber sole edition since I personally prefer it over felt. Felt tends to wear out way quicker and with all that discussion about invasive species, I do not feel the need to risk spreading them. 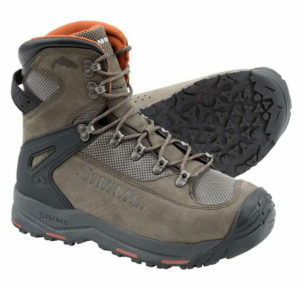 The main upper part of the Simms G3 Guide Boot is made from waterproof nubuck leather. You might ask, why you need that leather to be waterproof since water will enter your boots anyway. The reason for that is, the last generation of the Simms G3 had the problem of shrinking leather, once the material got soaked. They changed that with their next release and removed that problem because many people complained about it. The part right under where the lacing system is attached is made from a Thermoplastic Polyurethane coated textile. The lacing system itself is fairly traditional, nothing unnecessarily fancy designed. The midsole is made from EVA, a rubber-like material, which is supposed to enhance the feeling you have walking in the river since you do not want to feel every small stone you step on. The outsole is made from 4.0 mm Vibram rubber, a material often used for climbing shoes. If it does the trick on a vertical rock wall, it should give you decent traction in the river. Vibram is an italian company specialized boot soles for different terrains. Their rubber soles are popular among mountaineers all over the world and loved for their remarkable traction. To my surprise Vibram rubber actually performs better in warmer climates. In colder temperatures the rubber gets a little stiffer and soft sticky rubber might even be a better choice. In general Vibram is a little harder but convinces with an amazin longevity. It’s basically impossible to wear out such soles on a pair of wading boots. The sole itself stretches out on the tip of the boots, transforming to the toe cap. Nothing you want to miss out on if you ever hit your toes on an unseen rock deep in the river. It also limits the abrasion of the nubuck leather since the tip is the part of the boot that gets beaten up the most. The bottom of the sole provides patterns where you can attach Simms Star Cleats to improve the traction. The seams and everything else looks perfectly designed and well made. I did not see any flaws and even after the few times I used them so far, they still look like they came right out of the box. I had the chance to test several sizes and got the one that fits me perfectly. Since not everyone has that luxury, I checked back with the sizing chart on their website and found it to be accurate. They do not offer half sizes, so you should rather get a size slightly too large than slightly too tight. You can always adapt with an additional pair of socks or some extra inserts. You do not want to realize that you bought the wrong size when you get sore toes only after an hour of fishing. The high collar gives great ankle support while still not limiting your flexibility too much. They implemented some kind of joint halfway, so the boots do not feel too stiff when you wear them. Generally speaking, they feel a bit more natural and more like real boots, compared to other wading boots I had before. Starting with the most important aspect, the traction they provide while you fly fish on all kind of slippery stuff in the river. I tested them with and without cleats to see how well the Vibram rubber performs alone. Although it might sound strange, as mentioned earlier, the feeling those boots provide while you wade through the stream is great. You actually have a clue what you are standing on. 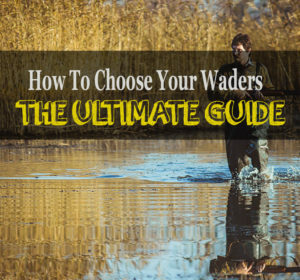 With other wading boots, you can usually only guess what you walking over when you can not see the river bed. The rubber itself performs well, I climbed up and down some rocks and although I probably looked strange while doing it, the boots provide control and decent traction and you can see why they use the material for climbing shoes. For the next test, I attached the studs. Simms’ Alumibite Star Cleats cost around $20 per pack and you will need two if you want to cover the soles completely. I agree that another $40 can seem expensive, especially when you keep in mind that you can buy a whole pair of cheap wading boots for that money, but trust me, the 40 bucks are well worth it. While the rubber itself was sufficient in traction, the improvement the studs provide is impressive. I never felt so confident while wading and crossed the river a few times more than necessary. The last challenge for the boots was a two-mile hike since fishing remote locations is often only possible if you walk a few miles away from commonly used paths. You certainly do not want to carry an extra pair of hiking boots and with the Simms G3, you really do not have to. I own a proper pair of hiking boots and can honestly say, at least I do not feel a big difference between them and the G3. Obviously, the soles would not last as long since they are mainly designed to provide grip and not to withstand the abrasion of ten-mile hikes or more, but besides that I am sure they would perform similarly. Heny Gilbey, a great photographer and avid salt water fisher, let us know that although the Simms G3 are great for freshwater, they seem to fail in saltwater. Apparently, the eyelets rod out quickly and lack any resistance to corrosion, as soon as they get into contact with saltwater. This won’t be an issue at all for streams and rivers, but the G3 Guide Boots are not made for ocean fishing. Henry also pointed out, that Simms Rivershed model performs great in said environment. In addition to my experience, I asked Justin, a fellow blogger (circumwanderers.com) and fly fishing guide with years of experience. 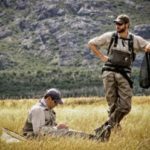 He is the founder of Hemispheres Unlimited, a booking agency covering some of the best fly fishing places on this planet and definitely knows what matters, when it comes to equipment. Make sure to check out Hemispheres Unlimited and his blog, both covering awesome and exotic fly fishing locations. Generally, I can say, that you see the quality the moment you open the box. These boots are expensive, but unlike many other products the money went straight into the materials used and the manufacturing process. I am confident that these boots will last me many seasons and I definitely do not regret spending that much money on them. If your budget allows it, there are really no arguments against this pair and that’s why you can find them on the first place in the best wading boots ranking. You get what you pay for and proper wading boots might even prevent you from falling or spraining your ankle. Again, If there is one expensive piece of equipment you have, make it your wading boots. YES, they are worth the money and NO, you will never regret buying them. I know quite a few fly fishing guides wearing them almost every day. Do I have to say more?